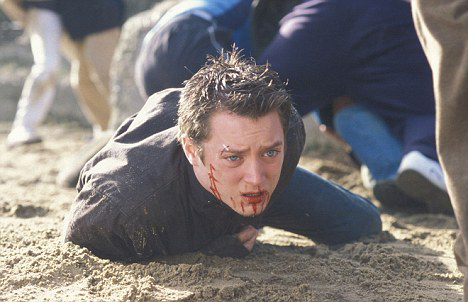 It’s a promotional photo of Elijah Wood from the movie Green Street (a.k.a. Hooligans, a.k.a Green Street Hooligans, a.k.a. Football Hooligans, a.k.a. The Yank) and it features what just might be the worst fake injuries in the history of cinema.